You made it! I'm so pleased, and impressed that you decided to keep going this week. You rock! I do believe it was time to visit a potentially tough topic with the haikus though, don't you? You didn't disappoint - this was a great one! Have a wonderful day - and a better one tomorrow. That's a great Haiku, isn't timing odd sometimes - so many coincidences can happen. 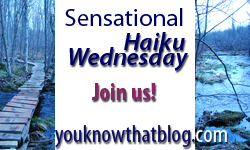 I like thinking through the topic, it's great to have a Haiku subject that really makes you think. You have so few words to say so much. The timing of this topic is incredible, isn't it? You took my breath away with your haiku and photo. Life and art intersect in interesting ways sometime. Love the Haiku... thought provoking. "That one makes me cry maw!" I love this Haiku. But even more than the Haiku, I love the picture, I live in Washington from 04-05 and I miss it so much! Can't wait to move back next year! I can only suggest taking small steps, or going wave by wave, in whatever direction feels best.